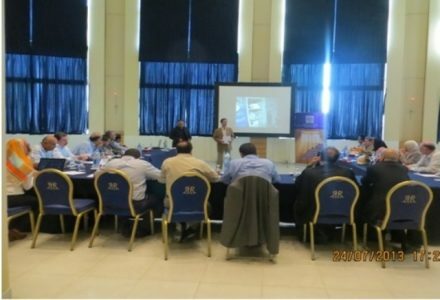 Penal Reform International (PRI) held the third meeting for the National Independent Inspection Team for monitoring care centers in Jordan on Wednesday, 24 July 2013 at Le Royal Hotel in Amman in the presence of the PRI acting director, Haitham Shibli and National Independent Inspection Team members. The team recently launched their first inspection visit on Wednesday, 10 July 2013 occurring on the first day of the holy month of Ramadan. During the meeting, the team discussed their inspection visits and inspection reports. Recently, the team had conducted visits to seven care centers in the Kingdom. A detailed report including an evaluation of the resident quality of care and quality of life, environmental services, dietary services, fire safety, etc., will be sent to the Minister of Social Development to take the necessary legal or administrative measures for any issues highlighted by the team during their visits. A press conference organized by Penal Reform International (PRI) and the Ministry of Social Development will be held on Tuesday 30 July 2013 at 2:30 p.m. local time at in the Ministry of Social Development to announce the launch of the team’s first inspection report.